Vulture is the common name for various large birds of prey within the family Accipitridae (Old World vultures) and the family Cathartidae (New World vultures), typically characterized by a featherless head, keen sight, good soaring ability, and generally scavenging behavior, feeding mostly on the carcasses of dead animals. Vultures are found in every continent except Antarctica and Oceania. The Old World Vultures are in the same family as eagles, buzzards and hawks, while the New World Vultures (including two species called condors), which comprise the entire family Cathartidae, are considered by some to be more closely related to storks. A particular characteristic of many vultures is a bald head, devoid of feathers. This is likely because a feathered head would become spattered with blood and other fluids, and thus be difficult to keep clean. While in the Western world, the term "vulture" tends to have unfavorable connotations—being used as a metaphor for those who prey on the weak or dying—these birds actually play a very valuable role in ecosystems as scavengers, removing dead animals. Indeed, the reduction of the number of vultures in some areas due to diclofenac poisoning (from consuming dead farm animals given this NSAID), has led to rotting carcasses and to greater numbers of rabies carrying rodents. In some areas of the world, vultures have a more favorable image, including being associated with loving, bonding, mothering, and protecting due to the vultures being seen together, with mother and child bonded together. A group of vultures is occasionally called a venue, and when circling in the air a group of vultures is called a kettle. The word Geier (taken from the German language) does not have a precise meaning in ornithology, and it is occasionally used to refer to a vulture in English, as in some poetry. 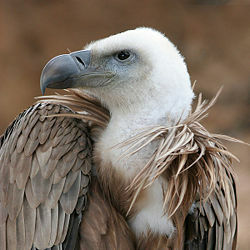 Vultures are classified into two groups: Old World vultures and New World vultures. These are not closely related and are sometimes placed in different orders—Old World vultures in the order Falconiformes and New World vultures in the order Ciconiiformes—although traditionally they have both been placed in the Falconiformes order. The similarities between the two different groups are considered to be due to convergent evolution. The Old World vultures, found in Africa, Asia and Europe, belong to the family Accipitridae, which also includes eagles, kites, buzzards, and hawks. Old World vultures find carcasses exclusively by sight. Old World vultures, which are not closely related to the superficially similar New World vultures and condors, do not share good sense of smell of some of the New World vultures. As scavenging birds, feeding mostly from carcasses of dead animals, Old World vultures find carcasses exclusively by sight. The New World vultures, found in warm and temperate areas of the Americas, comprise the family Cathartidae. New World vultures are considered not to be closely related to the superficially similar Old World vultures of the Accipitridae family. Traditionally these two groups of vultures were placed together in the order Falconiformes, but some place the New World vultures in a separate order, Ciconiiformes, with the storks (family Ciconiidae). Several species of New World vultures have a good sense of smell, unusual for raptors. The New World vultures comprise seven species in five genera, including two species known as condors (the Andean condor, Vultur gryphus, and the California condor, Gymnogyps californianus). The genera are Coragyps, Cathartes, Gymnogyps, Sarcoramphus, and Vultur. Of these, only Cathartes is not monotypic. The New World vultures have a pervious nostril. New World vultures are generally large birds, ranging in length from the Lesser Yellow-headed Vulture at 56–61 centimeters (22–24 inches) up to the California and Andean Condors, both of which can reach 120 centimeters (48 inches) in length and weigh 12 or more kilograms (26 or more pounds). Plumage is predominantly black or brown, and is sometimes marked with white. All species have featherless heads and necks (Zim et al. 2001). In some, this skin is brightly colored, and in the king vulture it is developed into colorful wattles and outgrowths. All species have long, broad wings and a stiff tail, suitable for soaring (Reed 1914). They are the best adapted to soaring of all land birds (Ryser and Ryser 1985). All New World vultures lack a syrinx, the vocal organ of birds, therefore the voice is limited to infrequent grunts and hisses (Howell and Webb 1995; Kemp and Newton 2003). The nasal passage is not divided by a septum (they are "perforate"), so from the side one can see through the beak, as in the Turkey Vulture (Allaby 1992). A group of White-backed Vultures eating the carcass of a Wildebeest. Vultures are scavengers, typically feeding on the carcass of dead animals. However, the palm-nut vulture, Gypohierax angolensis, an Old World vulture, while it will eat dead fish, is unique for a bird of prey in not preferring meat, but rather the the nut of the oil palm. 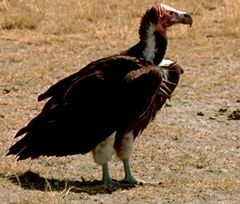 All living species of New World vultures and condors are scavengers. Indeed, the beak of New World vultures is quite weak, being adapted to feeding on partially rotted carrion rather than fresh prey. However, some New World vulture species, such as the American black vulture, have been recorded as killing live prey. Other additions to the diet include fruit, eggs, and garbage. Vultures seldom attack healthy animals, but may kill the wounded or sick. Vast numbers have been seen upon battlefields. They gorge themselves when prey is abundant, till their crop bulges, and sit, sleepy or half torpid, to digest their food. They do not carry food to their young in their claws, but disgorge it from the crop. These birds are of great value as scavengers, especially in hot regions. The vulture population in India and Pakistan has declined by up to 95 percent recently in the past decade, and two or three of the species of vultures in South Asia are nearing extinction. This has been caused by the practice of giving working farm animals diclofenac, which is a non-steroidal anti-inflammatory drug (NSAID) with anti-inflammatory and pain killing actions. Diclofenac administration keeps animals that are ill or in pain working on the land for longer, but, if the ill animals die, their carcasses contain diclofenac. Farmers leave the dead animals out in the open, relying on vultures to tidy up. Diclofenac present in carcass flesh is eaten by the vultures, which are sensitive to diclofenac, suffering kidney failure, visceral gout, and death as a result of diclofenac poisoning. The decline in vultures has led to hygiene problems in India as carcasses of dead animals now tend to rot, or be eaten by rats or wild dogs, rather than be tidied up by vultures. Rabies among these scavengers is a major health threat. India has the world's highest rate of rabies. 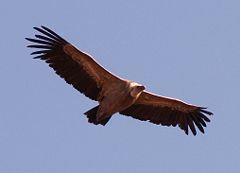 The decline in vultures causes particular problems for certain communities, such as the Parsi, who practice sky burials, where the human dead are put on the top of Towers of Silence and are eaten by vultures, leaving only dry bones. Meloxicam (another NSAID) has been found to be harmless to vultures and should prove an acceptable alternative to diclofenac. The Government of India banned diclofenac, but it continues to be sold over a year later and is still a problem in other parts of the world (NS 2006). In Southern Africa, the name for a Nubian vulture is synonymous with the term applied to lovers, because these vultures are always seen in pairs, mother and child remaining closely bonded together. Pairing, bonding, protecting, and loving are essential attributes associated with the vulture. was the uniliteral sign used for the glottal sound (three) including words such as mother, prosperous, grandmother, and ruler. In the Western world, the image of the vulture is far more negative, with vulture used as a metaphor for those who prey on the weak or dying, with associated negative connotations of cowardice and selfishness (although the vulture plays an important natural role). British Broadcasting Corporation (BBC). 2006. Bird groups hopeful on vultures BBC February 1, 2006. Retrieved January 26, 2008. Ferguson-Lees, J., and D. Christie. 2001. Raptors of the World. London: Christopher Helm. ISBN 0713680261. Gentleman, A. 2006. India's vultures fall prey to a drug in the cattle they feed on. New York Times, March 28, 2006. Grimmett, R., C. Inskipp, T. Inskipp, and R. Grimmett. 1999. Birds of India, Pakistan, Nepal, Bangladesh, Bhutan, Sri Lanka, and the Maldives. Princeton field guides. Princeton, N.J.: Princeton University Press. ISBN 0691049106. Hilty, S. L. 2003. Birds of Venezuela. Helm field guides. London: Christopher Helm. ISBN 0713664185. Howell, S. N.G., and S. Webb. 1995. A Guide to the Birds of Mexico and Northern Central America. New York: Oxford University Press. ISBN 0198540124. Kemp, A., and I. Newton. 2003. New World vultures. In C. Perrins, ed., The Firefly Encyclopedia of Birds. Firefly Books. ISBN 1552977773. New Scientists (NS). 2006. Painkillers turned bird killers New Scientist Tech (from New Scientist Magazine, issue 2577, November 14, 2006). Retrieved January 26, 2008. Reed, C. A. 1914. The Bird Book: Illustrating in Natural Colors More Than Seven Hundred North American Birds. The University of Wisconsin. Ryser, F. A. 1985. Birds of the Great Basin: A Natural History. University of Nevada Press. ISBN 087417080X. Sinclair, I., P. Hockey, and W. R. Tarboton. 2002. Sasol Birds of Southern Africa. Cape Town: Struik. ISBN 1868727211.
van Wyka, E., H. van der Bank, and G. H. Verdoorn. 2001. Allozyme variation in four populations of African whitebacked vultures (Gyps africanus) and phylogenetic relationships between four vulture species from southern Africa. Biochemical Systematics and Ecology 29: 485–512. This page was last modified on 30 May 2008, at 01:14.